An air compressor can be defined as a device which converts power (using an electric motor, diesel or gasoline engine, etc.) into potential energy stored in pressurized air. Globally, the demand for air compressors is driven by increasing applications and low maintenance and multiple options for fuel for operating are the major factors which are expected to be key growth drivers during the period of study. 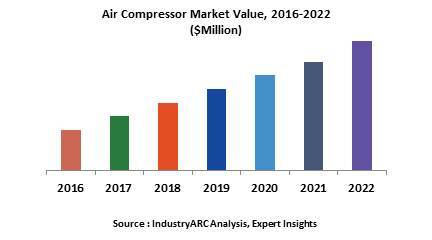 Geographically, Asia-Pacific dominated the air compressor market driven by higher demand and consumption of air compressors in various industrial applications. Asia-Pacific was followed by North America and Europe as second and third largest market for air compressor market. Asia Pacific is projected to have the fastest growth, owing to rapidly developing industrial infrastructure, increasing number of end-use industry players in the region especially in developing nations such as China and India in this region. This report identifies the global air compressor market size in for the year 2014-2016, and forecast of the same for year 2022. It also highlights the market drivers, restraints, growth indicators, challenges, and other key aspects with respect to global air compressor market.